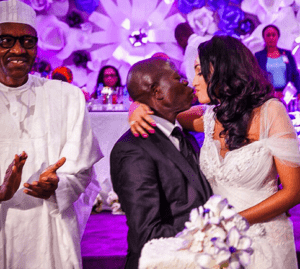 Governor Adams Oshiomhole of Edo State, who remarried recently, has revealed that he met his new wife a virgin. Oshiomhole spoke during testimony time at a thanksgiving service organised for him on the occasion of his wedding to his Cape Verdian heartthrob. He advised the youth of the church to kick out corruption in all its ramifications, including domestic and moral corruption. He boasted that with an APC Comrade as the helmsman of the country’s politics, a revolutionary change has swept over the whole country. “I implore all of you to fight corruption today because the APC government is one that will not condone corruption, not even domestic corruption. “I can boldly tell all of you that I was a very principled man during my first marriage. I didn’t succumb to the worldly pleasures of this lustful environment, even though I had lots of opportunities. And it was this principled sobriety that made me fish for a virgin wife. “I can boldly say to you all that I was the first man to know her and initiate her into worldly ways. This is the kind of spirit I want Edo youths to inculcate, instead of messing around and engaging in different shades of adultery and fornication,” he said.